4. my dirty converse without its shoelace, on the street. 8. many tourists pay visits to Hong Kong for its night view, jumping on a double-deck bus, checking out the bright lights along Nathan Road. for me? this is part of my daily life. I'm learning to appreciate my city. 10-12. Went on a week's trip to Taiwan. Sunscreen, luggage, passport and boarding pass. 14. OOTD + FOTD + NOTD = LOTD. Wearing the newly acquired Shiseido Integrate eyeshadow palette in the limited edition shade. Lovely! 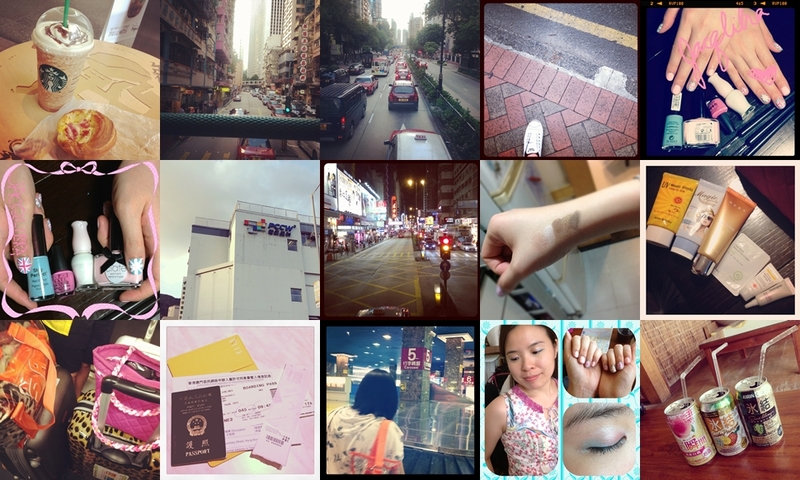 I realise my Instagramming posts are not very beauty-related, read at your own risk/interests! To show my other blog some love, I'll be posting (these instagramming posts) alternatively here, and over there. You may have notice I jump to #12 from #10, that is because #11 was up a few days ago! Also, I'll be following Sandra's footsteps (I'm such a lame copy cat), to do the "Blogust" challenge. Hopefully I will be posting at least one post every day in the month of August. Come back for more randomness by Jacq!